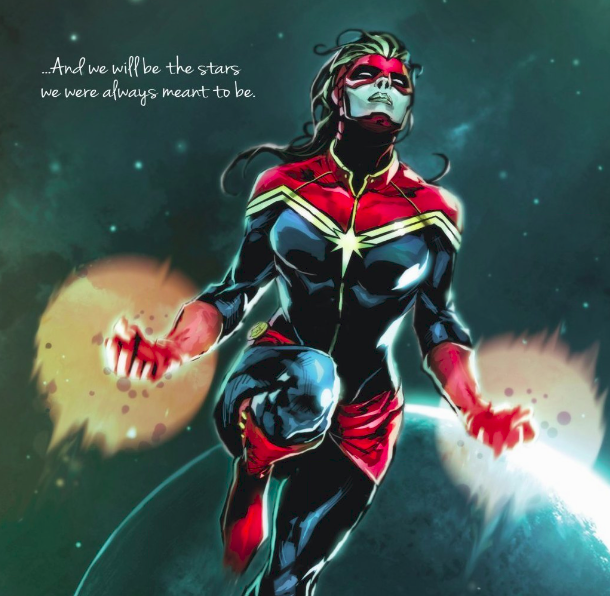 Marvel's Captain Marvel Prelude TPB Review – AiPT! A sampler for all things Carol Danvers. Marvel’s Captain Marvel Prelude should really be titled something along the lines of “Who is Captain Marvel?” The actual prelude to the upcoming film takes up a small space in the overall trade, while the rest is dedicated to the starting point of other runs. The collection opens with Marvel’s Captain Marvel Prelude #1, by Will Corona Pilgrim and Andrea Di Vito. Normally, these prelude comics suffer because they can’t really explore anything of interest. You’re not going to see Tom Holland’s Spider-Man face off with an MCU Doc Ock in these pages until it happens on screen. However, Corona Pilgrim is able to navigate around this by doing something else entirely — focusing on Nick Fury and Maria Hill. The issue opens with the end of Avengers: Age of Ultron and follows Fury and Hill through Captain America: Civil War up to their appearance in Avengers: Infinity War, showing us where they met with Tony and Steve along the way. It is frustrating that we get nothing of Carol beyond the pager seen at the end of Infinity War, but given how these preludes typically play out, it’s nice to have some semblance of a story here that isn’t just recapping events from the films. The artwork by Andrea Di Vito and color artist Laura Villari is gorgeous as well, especially the smooth take on Tony’s nanotech Iron Man suit. The rest of the trade paperback does focus on Carol’s long history. Included are Ms. Marvel #1 from 1977 by Gene Colan and John Buscema, 2006’s Ms. Marvel #1 by Brian Reed and Roberto De La Torre, Captain Marvel #1 by Kelly Sue DeConnick and Dexter Soy, Generations: Captain Marvel & Captain Mar-Vell #1 by Margaret Stohl and Brent Schoonover, and The Life of Captain Marvel #1 by Stohl, Carlos Pacheco, and Marguerite Sauvage. The inclusion of all these disparate starting points paints a larger image of Carol Danvers and her history. At the end of most of the issues is a little addendum showing where readers can continue the story (a friendly plug: read our review of the Ms. Marvel Epic Collection: This Warrior, This Woman). As a starter for the character, Marvel’s Captain Marvel Prelude works well. While it’s a bit disappointing that the actual prelude to the film doesn’t involve Carol Danvers, it’s still a nice catch-up on what Nick Fury has been up to in the gap between Avengers: Age of Ultron and Avengers: Infinity War. And given how many times the character has been revamped, it’s nice to see both Carol’s debut as Ms. Marvel, and the 2006 Ms. Marvel series represented alongside Kelly Sue DeConnick’s game changing run. While this isn’t likely to be the crown jewel in anyone’s collection, Marvel’s Captain Marvel Prelude does what it set out to do and is a great entry point for anyone looking to better acquaint themselves with Marvel’s premiere heroine. Functioning as a sampler for all things Carol Danvers, Marvel's Captain Marvel Prelude does a great job at providing various entry points in Captain Marvel's long history. It's unfortunate though, that the prelude offers no look at Brie Larson's upcoming take on the character. While the titular prelude doesn't offer much for Captain Marvel, herself, Will Corona Pilgrim and Andrea Di Vito make exploring Nick Fury's side adventures fun. While it was expected to see Kelly Sue DeConnick's game-changing debut of the "Captain Marvel" moniker for Carol, it's nice to see her adventures as Ms. Marvel acknowledged as well. Take a good look at the cover image, as that's all readers will see of Brie Larson's take on the character.